A while ago the digital preservation team of the professorship in communication systems got involved in Digital Archaeology and Forensics of some old floppy disks of unknown origin. It was a cooperation with The Archives NZ being asked to identify the content of 5.25” disks. The hardware part – reading the disks and producing images from them – was handled by the archives and the Freiburg team joined at a later stage after the floppy images were created and the content easily accessible for further scrutiny. 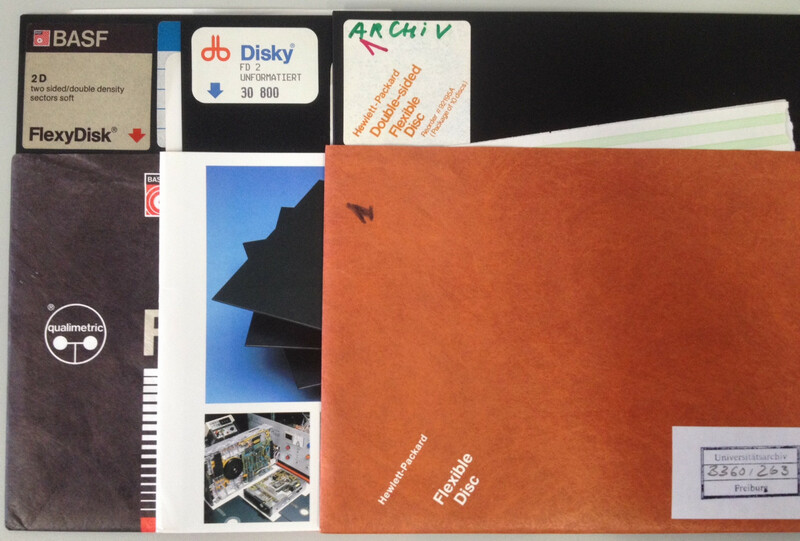 This time we were challenged at the very beginning of the workflow: The university archive in Freiburg recently received a set of 8” floppy disks which might contain interesting case and research data. The hand-over procedure did not generate much valuable information, but just a stack of those disks with some additional paper stuck in the disk sleeves. The floppies in question are dating from the early/mid 1980s. The information about them is rather scant. The floppy labels of the various brands (e.g. BASF and HP manufactured a couple of disks) do not provide any information on the (operating) system used to create them or on the formatting. Some sheets of papers put into the paper sleeves of the floppies seem to indicate (looks like head and track information) that no filesystem was used at all. Inquiries in the clinic only brought up the hint, that they introduced office writers (electronic IBM trypewriters) and later CPM machines both featuring 8″ drives. Because of the number of HP disks in the set it was presumed that an HP system could have been used and further investigation into the part numbers was tried. This having determined is from a Hewlett-Packard CAT command, which is interpreted as probably from an HP 9845/35 series. H is the drive type (9895A), 8 the controller select code, 0 the drive address, 1 the unit address. The first entry indicates a large data file of 1188 bytes, maybe a database file. Of course, this assumption might be totally wrong. While extracting data from more recent 5.25” and 3.5” floppy disks which were used later on in the university, the case for 8” is more complicated. 5.25” and 3.5” PC formatted disks were quite common and widely used. Thus, it is still possible to find systems which feature a 3.5” drive and systems which have at least a floppy controller present. At a computer centre usually all components should be still available to get a working setup to read the mostly DOS formatted disks (MFM format). 8” floppy disks were generally out of use by the beginning/mid 1990s and were not part of the office or personal computers when they became commonly used. The 8” disks have a completely different form factor (obviously) and different connectors for both data and power supply. Thus, there is no standard support for them in most operating systems. Fortunately, we got Dr. Denise de Vries from Flinders University in Adelaide/South Australia as visiting scientist. She did a magnetic media recovery and evaluation project “Computer disk collections at the State Library of South Australia: Creating disk images of born digital content”. To conduct the reading the first idea was to find a proper machine which can both connect the floppy drive and host a fairly recent operating system to handle the read data and transport it more easily. For the experiment two machines were evaluated: An older HP AMD CPU office desktop machine (roughly 8 years old) and a little bit younger DELL Optiplex system both still featuring a floppy controller. The BIOS of the HP allows setting a single floppy to either 3.5″ 1.44 Mbyte or 5.25″ 1.2 Mbyte. The more fancy DELL BIOS made it more difficult with the older floppies, as only the 3.5″ could be configured. Additionally to make things more challenging, to actually attach the 5.25″ or 8” to the machine electrically to the DELL, a power cable adaptor (from the more recent 3.5” SATA/HDD connectors to the old peripheral power connector style 4pin) was required. As no 8” hardware was to be found in the university a “new” one was to be bought. The market in those days offered a range of drives which changed a bit over the time. Thus, we sought the advice from colleagues around the world (primarily Mick from Archives NZ and Euan from Yale digital library) for preferences on the type of disk drive. Older drives might be restricted to single side or might require AC to power the spindle motor (AC rating might vary depending on the country where the drive was originally sold). We ended up with a half height version not requiring AC power. A Mitsubishi (M2896-63) 8” drive in mint condition was acquired for about 240€ from eBay. In a second step a converter for the power supply of the 5/24V of the drive and a floppy disk adapter for using 8″ drives on PC floppy controllers were procured. Pretty much the only available option is the device made by dbit. The necessary cables were scavenged from old systems and recycling bins (like e.g. 50pin ribbon SCSI cable and multiple floppy attachment cables) and refitted to be used with the 34- and 50-pin connector of the drive. The power converter plugs into a spare IDE power connector from the PC’s power supply. One of our challenges is to acquire the necessary knowledge on the hardware and it’s basic operation. Thus, we tried to get in contact with a private individual owning a personal hardware museum containing machines of the era the disks are from. That person actually owns a couple of 8″ drives in several system. As the time is a bit pressing we started to purchase hardware components by ourself as the actual costs for the very basic setup of a drive connected to some older PC were acceptable (roughly 500€ for the drive and the adaptors). Any additional hint or information could be useful for us. We are just about to learn 8” hardware and its characteristics and we easily might overlook aspects. Any hint regarding the application of the floppies pictured (e.g. is there an indication that those particular floppies were used in a particular system and not in another).